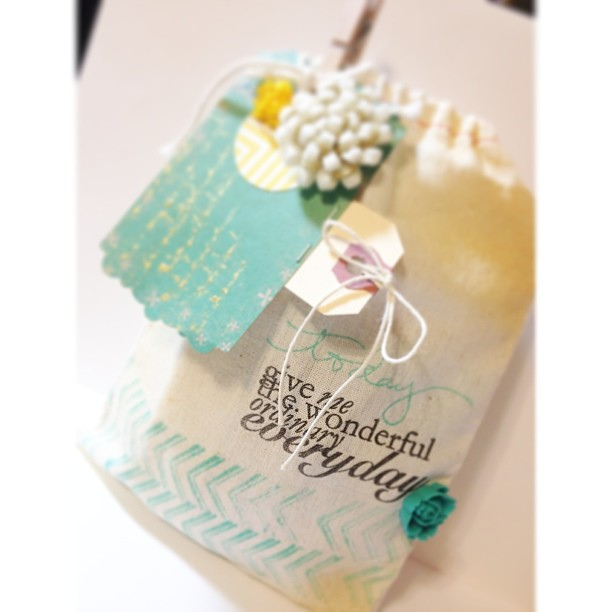 So I'm totally in love with these cute Canvas Bags that Studio Calico packages all my little goodies in. I've been collecting them so I can alter a few for Teacher Appreciation week. Tonight when I came home from work, I had my Studio Calico box waiting for me. When I opened it and saw yet another canvas bag, I stopped what I was doing and quickly altered one. I'm meeting a local friend tomorrow and knew I wanted to give her a few goodies so I quickly made this. It literally took me twenty minutes to put together. Project Life update coming soon!!! That bag is so cute. What a great way to give a gift. I love how well you were able to stamp and add the details. Great job. You always have such wonderful ideas and projects. Wow! So nicely detailed and pretty! You did a great job on this.